The blurb for this shark fest doesn’t do the movie justice. In fact, I almost didn’t bother watching it because of the ‘so what?’ factor. Maybe they ought to have at least mentioned that the group of friends are trapped on an island in shark infested water. Or perhaps hinted that there was more than nature’s will behind the rampant sharks. That would have been accurate and a better lead in to this fun shark movie. Anyway, as mentioned, a group of friends heads to an island home in a large saltwater lake. When one of them is attacked, they discover that the lake is infested with sharks. Without giving too much more away, they’re eventually stranded on the island where no cell phones work. Much of what the characters did was a little far-fetched and on the stupid side. They also don’t question a few things the locals do that are obvious clues that things are not kosher. If you can ignore those, the movie has a nice twist to it and is enjoyable to watch. 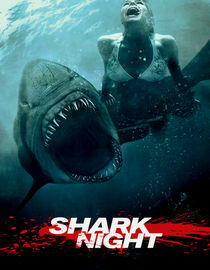 Not the best of shark movies but certainly not the worst.